I recently found out that my dipole was a bit shorter than it should be. Since I use 75 ohm HDTV coax (Nordix CM407 Cu PE) as my feedline, I was losing power in the impedance mismatch. I also started to be a bit annoyed by it being single band only. So I started looking for a possible solution. The only reasonable change I could do regarding antenna was to use a bit longer wire (about 44 feet), ladder line and a matchbox to match it to the 75 ohm feedline. This is the basic concept of non-resonant multiband dipole as described in ARRL Handbook and Antenna book. I built the feedline out of 0.5mm^2 insulated stranded wire (because I have plenty..) and cut 6mm diameter hard irrigation tubing (black, 15m for 99Kč - 4€ in a local hobby store) to pieces to make the separators. I then cut slots to the separators, inserted wire and secured using black plastic cable ties. I tried many different ways of making the ladder line, but this way was the fastest and cheapest. Then I started looking at the available ATUs and quickly figured out that the prices are very high. I won't describe the details as DJ0IP already dedicated many pages to this topic at his website. Since I am only interested in low power (10W max) it was quite easy to come up with home-brew solution. It is a switchable L network with 16 coils (2 times 8 to make it symmetric) and a variable capacitor I got at ebay wired as split stator (the two sections in series). I also added one additional fixed 200pF/1000V (2x4x100pF/500V NP0) capacitor that can be switched in and out of the circuit. 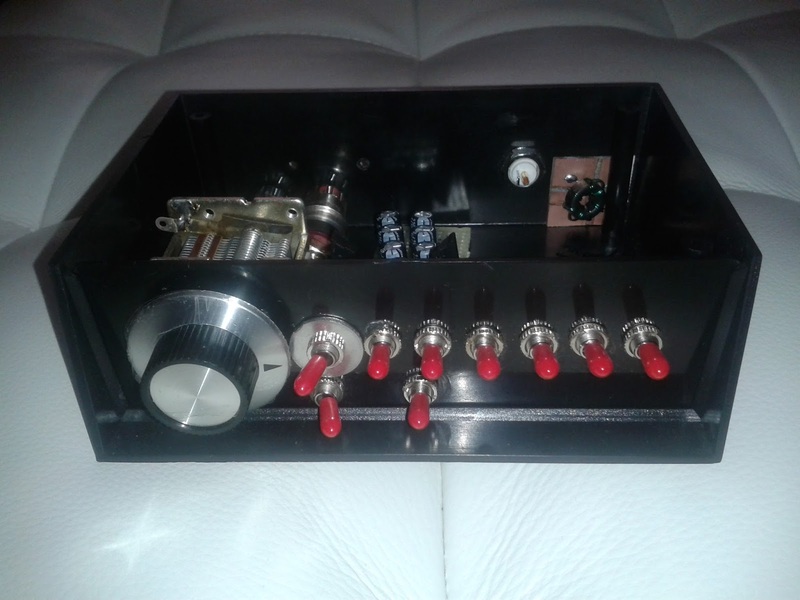 There is also an 1:1 current balun (7 bifilar turns on FT50-43) at the input side of the tuner. and the relay controller board in the middle. Front panel (I added one more switch later). 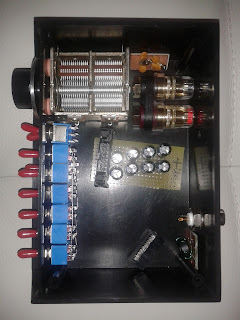 You can also see the current balun at the back side right from the BNC connector. 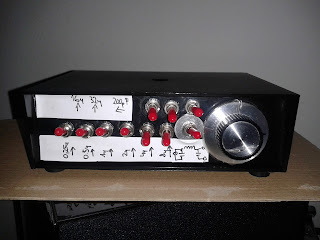 Coil switching is accomplished by FTR-B4 4.5V locking relays (or bipolar as we call them in CZ) that are directly controlled by front panel switches. I decided to do it this way to minimize wiring length and parasitic effects. The circuit is powered by single cell LiPol battery (3.7V nominal) that is used only when relays change state and so will stay charged for a long time. 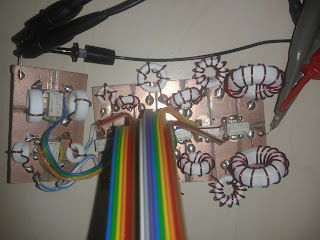 Coils, relays and the control cable on a copper clad board. 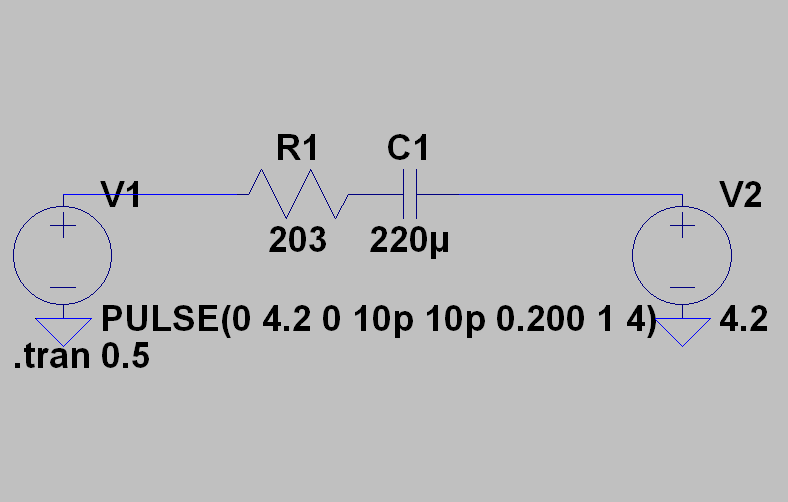 Simulation circuit of the relay controller. 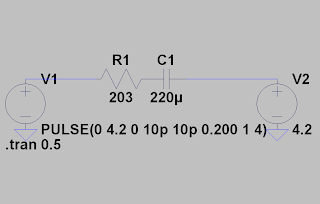 R1 is the relay coil and V1 is the switch. All the coils were wound on toroids from the Ferroxcube 4c65 material. I used three different sizes of cores (9mm, 14mm and 23mm OD) and I wound the inductances so they are about 0.125uH, 0.25uH, 0.5uH, 1uH, 2uH, 4uH, 8uH and 16uH. Since there are two coils of the same inductance in symmetric series it gives me an inductance range of about 0.25uH to about 64uH. The result was an "ugly" box that is able to match my antenna at least on 20m and higher. Those are the bands I wanted to use. I used my miniVNA with vna/J in Smith chart mode to find the settings for different frequencies. The settings for 20m and my dipole were 3.75uH and minimal possible capacitance connected to the antenna side. The fact that I tried to learn how a Smith chart works helped me a lot when figuring out the values :).